This document sets up an agreement for joint ownership of either a towed touring caravan or a semi-permanently installed mobile home. The joint owners may be friends, relatives, or previously unknown to each other. 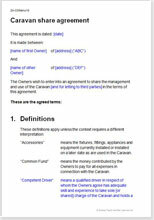 The agreement covers ownership rights of the parties in whatever proportions you choose. It also includes a timetable and notes on the manner of sharing the use of the caravan and the responsibilities of each party in maintenance and upkeep. In this type of arrangement, disputes are most likely to arise when one of the parties wants to sell his or her share, but the other owner neither wants to buy it, nor wants to sell his or her own. This document provides you with alternative options for how conflicts might be resolved. Our using of plain English makes this easy to understand by the parties. Of course, we also give you the usual Net Lawman comprehensive notes to take you through the document simply and easily.